My former partner and dear friend Stuart Tilt would inevitably say to a Seller during a listing appointment, “Pricing your property is an art, not a science.” This is true to a certain extent. There are, though, facts and figures that help determine a price range. I will discuss key considerations, not necessarily in order of importance, as each factors into an overall consideration in successfully marketing and selling a property. Motivation: Your motivation for selling your property is at the core of the pricing. If you have to sell due to financial, health, job, or personal reasons then your asking price needs to be very attractive. You may be forced into a position of having to price below the market in order to entice a buyer. On the opposite end of the spectrum, if you would like to sell but have no need to, your pricing can be more aggressive as long as you are willing to wait for the buyer to materialize who is willing to pay a premium for you home. I must note that, in the past 4 years, I know of no closed transaction in the Bozeman Area in which I think a Buyer over-paid for a property, while I do know of many instances of Buyers paying far below replacement cost for a home. Square Footage: Agents provide Buyers with data on houses, and, in today’s world of Internet and search engines, Buyers frequently research the existing real estate market before contacting an agent. One of the facts they seek is a home’s square footage and the cost-per-square-foot. The price-per-square-foot ranges in listed “luxury” homes between $200 to $600 a square foot. Buyers demand the square footage price to reflect the level of workmanship, materials, architecture, setting, finishes, landscape, neighborhood setting, and overall design. They mentally compare not only the total asking price but also the square footage price when determining if the property is a solid value, a great deal, or over-priced. Location/Acreage/Setting: The cliché, “Location! Location! Location,” is valid. How close are you to town? What do the homes around you look like? Your neighbors can add or detract from your property’s perceived value, and unfortunately there is little you can do about that. How easy is it to drive to your house? Is the road paved? Is the house exposed or is it nestled into a hillside or woods? Location matters, along with acreage, the view shed, privacy, accessibility, and even the road to reach your home. My experience has shown a trend in recent years of Buyers wanting to be within a 20 minute or less drive time to Downtown Bozeman. As our community continues to thrive with rich cultural experiences, festivals, restaurants and shops, newcomers want to participate and they anticipate frequent trips downtown. There are also Buyers seeking the “Montana Experience” of mountain settings, ample wildlife, horses, easy access to state and national lands, and live water. Amenities: Buyers are excited and swayed by amenities and features that appeal to them and add character to a property. A true chef is thrilled when they see a big, well-designed pantry and chef-quality appliances. Horse people appreciate multiple pastures and ground that grows a crop of hay. Nearly everyone moving to Bozeman wants live water on their property, which is very difficult to find. Home theaters are not as popular as they once were, but sound systems and exercise rooms still have big appeal. Desirable features and hard-to-find amenities increases your ability to legitimately set a higher asking price. Truly “rare” properties command a higher price to a certain extent. Unfortunately, a property that is too idiosyncratic and unique often times results in narrowing an already small market. Your Competition: The typical Buyer for high-end properties in the Bozeman Area is from out-of-state. They are viewing properties over 2 days, with 6 to 8 homes that have been previously identified through Internet searches and discussions with their agent. Your property will be judged and weighed against the other viewed properties. All the factors of pricing, location, amenities, and ambiance will factor into a Buyer’s reaction. Buyers have emotional responses to homes, but before they will even take the time to view your home, they generally have pre-screened your place and decided that your price fits within their budget. It is always wise to compare your house to the other properties most likely to be seen by a potential buyer. In this manner you can determine if your pricing “fits” your property and the existing market. You and your agent should also identify what sets your home apart from the competition. What is special? Desirable? Noteworthy? 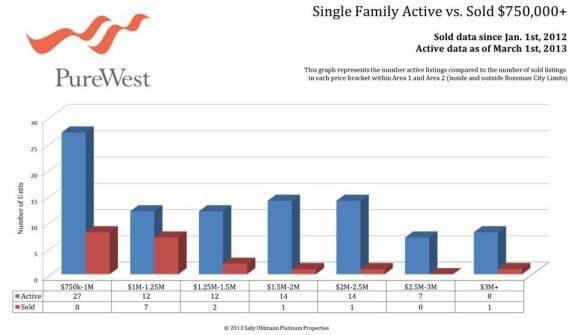 Comps and Appraisal: The high-end market in the Bozeman Area is on an upswing, however, it remains relatively small. Below is a chart of number of units listed and sold by price points for the past year. As your asking price increases, your number of viewings and odds of closing on your property decreases. Also, Buyers search real estate listings by price points, and many Buyers set a ceiling and simply will not look at a home priced at $1,500,000, but will look at one priced at $1,499,000. Great agents know which properties have sold, what is currently on the market, and how your property will be received by other agents and Buyers within price ranges. This is where the “Art” in pricing comes into play. Another consideration today is whether your home will appraise for the Buy/Sell price in a contract. Over the past 4 to 5 years, many properties have fallen out of contract when the appraisal has come back below the contract price. Appraisals are based on the actual sales of similar houses within a twelve month period and ten mile radius. Our small market does not provide for good comps to work from. The appraiser makes adjustments comparing your home to ones sold according to finishes, square footage, and items I’ve mentioned above. Before pricing your home, it is wise to know not only what is currently on the market, but also what has recently sold. Conclusion: The price placed on your home when it is first listed will be a “First Impression” to agents and potential Buyers. Agents will decide if your pricing is reasonable. If they deem it over-priced, they tend to show your home to their Buyers as an example of an over priced home so as to make their own listings more price-desirable. It is important to list your home with full knowledge of the market, your competition, and the reasons that justify your asking price. When I am doing a listing appointment with a Seller, I explain these key points in detail and provide the Seller with a price range, which is based on facts and blended with art. I offer potential sellers an honest assessment of their property in today’s market. 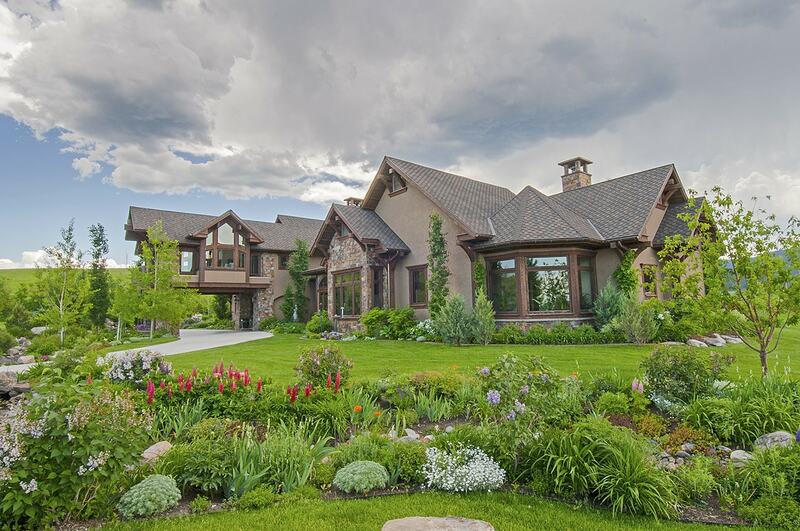 Arriving at a list price is an art, perfected over years of marketing and specializing in the Bozeman luxury real estate market.